LET US KNOW YOUR YEAR, FRONT SPROCKET TOOTH COUNT , REAR SPROCKET TOOTH COUNT AND WHAT COLOR CHAIN YOU WANT, CONTACT LINK AT TOP OF PAGE JUST SEND US AN EMAIL . SPROCKET INFO IS ALL BELOW . Conversion kit includes everything needed to covert your 86-up 5 speed belt drive to a heavy duty 530 O-ring chain:. This kit is for a stock size 130/150 rear tire..
22T Front Sprocket and 48T Rear Sprocket is equivalent to the stock belt drive gearing.. When using a 21 Tooth Front Sprocket:. 48T Rear Sprocket= 4% Deeper (Faster Acceleration). 49T Rear Sprocket= 6.5% Deeper - This is the same ratio as a stock chain drive 1985 FXRS. 51T Rear Sprocket= 10.5% Deeper. When using a 22 Tooth Front Sprocket:. 47T Rear Sprocket= 2.5% Overdrive (More Top Speed). 48T Rear Sprocket= Stock Belt Drive Ratio. 49T Rear Sprocket= 4% Deeper (Faster Acceleration). 51T Rear Sprocket= 6% Deeper. • 21 Tooth or 22 Tooth. 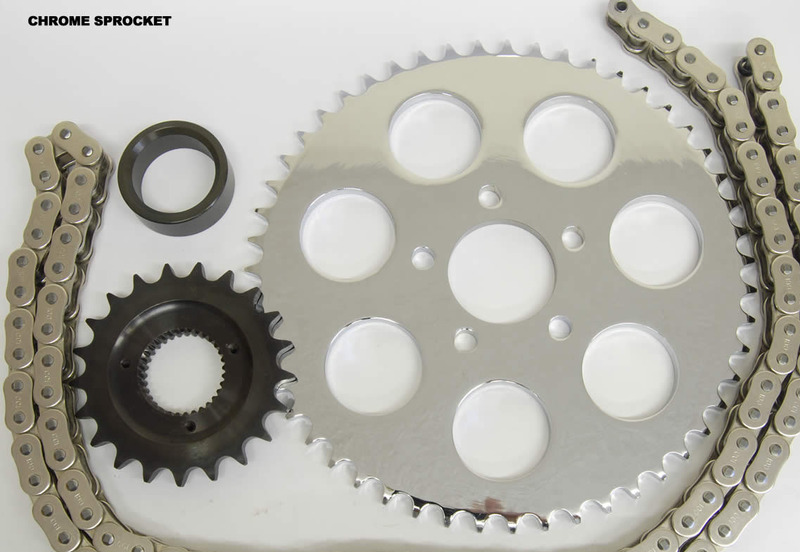 • Full thickness for 530 Chain, beware of other thin .25 thickness sprockets out there..
• Steel Sprockets last longer than aluminum sprockets and are ideal for high load situations (Burnouts, Wheelies, High Horsepower Engines). • Black Powdercoat Steel or Chrome plated Steel. • 48, 49, or 51 Tooth Available. 530 Series O-Ring Chain, 120 Link. • Includes Rivet Master Link. • Component designs optimized with computer analysis provides higher tensile strength..
• Specially controlled heat treatment means tougher material..
• Reinforced roller offers higher impact resistance and longer durability..
• Available in Natural, Black or Gold. Belt to Chain Transmission sprocket spacer. • Special made to use stock mainshaft seal with correct length for chain sprockets..
• Included in all kits now..